Prominent & Leading Exporter from Coimbatore, we offer turbo charger housing castings. Manufacturer, Supplier, Distributor, Trader and Exporter of Turbo Charger Housing Castings in Coimbatore, Tamil Nadu, Karnataka, Andhra Pradesh, Kerala, India, North India. 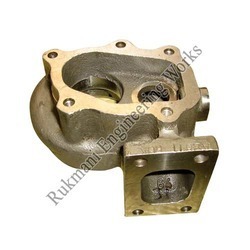 We are comprehensively engaged in delivering a wide and supreme range of Turbo Charger Housing Castings. This range is developed utilizing modern machinery and superior grade raw material in strict adherence with the highest quality norms and standards. Our quality personnel ensure to check the entire range to maintain its authenticity throughout the manufacturing process. This range is also appreciated among the clients for its durability and corrosion resistance. We offer wide range of C. I. & S.G. Iron castings. Turbo charger housing castings is one of the castings we do in both C. I. and S.G. according to our customer’s specifications and grades. The Turbo charger housing castings components are casted under strict supervision aiming to maintain consistent quality by having a check on every step. Looking for Turbo Charger Housing Castings ?